Contact Details : Contact The Authorised Officer : Mr.Amit Kumar Sinha : 9888410812, 011-26782215. Lot details : SML Isuzu Limited, Smdc Sartaj CNGE Truck bearing Chassis No. MBUWEL4XDV0220141, Registration No. DL-1LX-0160. MODEL- 20.05.2016. 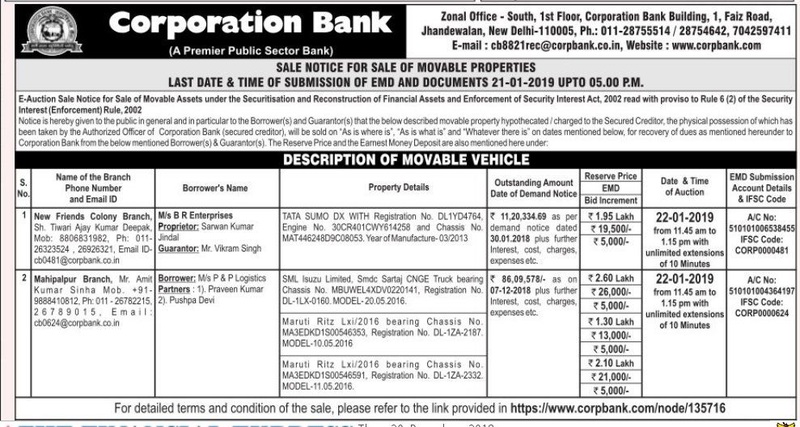 Schedule of Property : SML Isuzu Limited, Smdc Sartaj CNGE Truck bearing Chassis No. MBUWEL4XDV0220141, Registration No. DL-1LX-0160. MODEL- 20.05.2016. Inspection Details : For Inspection Details Please Contact The Authorised Officer : Mr.Amit Kumar Sinha : 9888410812, 011-26782215.